Papers: ca. 1831-1889, approximately 80,000 items. The papers of James A. Garfield contain family, personal, and official correspondence including records of Garfield’s Civil War military service, diary (1848-1881), speeches and other public statements, legal papers, genealogical material, college notebooks, tributes, printed matter, scrapbooks, and other material relating primarily to Garfield’s career and death. Subjects include Ohio and national politics, the disputed election of 1876, tariff and national finance, Credit Mobilier of America, and the Fitz-John Porter court-martial. Other topics include education, Hiram College, the Disciples of Christ, and the Salish (Flathead) Indians. Also includes diaries, account book, and other papers (1881-1889) of Garfield’s daughter, Mary Garfield Stanley-Brown (Mollie). Correspondents include Chester Alan Arthur, Harmon Austin, Jeremiah S. Black, J. M. Bundy, Alexander Campbell, William E. Chandler, Julius Orrin Converse, Jacob D. Cox, John Jay Curtis, Madeleine V. Dahlgren, Ulysses S. Grant, Mark Hopkins, William Dean Howells, Robert Green Ingersoll, Francis Lieber, Thomas M. Nichol, Thomas Wharton Phillips, Albert M. Pratt, Whitelaw Reid, James H. Rhodes, A. G. Riddle, James S. Robinson, John P. Robison, William S. Rosecrans, John Sherman, Platt Rogers Spencer, and Samuel Ward. A finding aid is available in the library and online. Papers: ca. 1879-1950, 98 linear feet. Persons represented include James A. Garfield. Papers: In the Harry A. Garfield Papers, 1888-1934, approximately 60,000 items. Persons represented include Harry Garfields father, James A. Garfield. Papers: In Lucretia R. Garfield papers, 1807-1958, approximately 55,000 items. Persons represented include Lucretia Garfields husband, James A. Garfield. Papers: In the Frank Hastings Hamilton Papers, 1863-1887, 200 items. Documentation on President James A. Garfield is in a scrapbook of Dr. Frank Hastings Hamilton, who attended the President after he was shot. Papers: In Almon Ferdinand Rockwell papers, 1852-1900. 3 feet (ca. 2,000 items). Includes 90 letters from Garfield and material concerning their joint investments and Garfields assassination. A letter from James A. Garfield to D.C. Pavey written on August 24, 1880. In the letter, Garfield acknowledges Paveys congratulatory letter. One certificate is from James Garfields memorial service, February 27, 1882, sent to Susan Enos, Springfield, Illinois, by David Davis. A second certificate recognizes L.E. Enoss contribution to the Garfield Moument Fund. A letter from James A. Garfield to Irvin McDowell written on February 11, 1871. Papers: October 1, 1876. 1 military appointment. A letter from James A. Garfield to G.A. Foster written on June 29, 1880. In the letter, Garfield thanks Foster. A letter from James A. Garfield to Wellington Smith written on July 22, 1880. In the letter, Garfield writes that he is pleased that our friends are working together harmoniously. Also, Garfield will not make any promises he cannot keep. Papers: In the Autographs and Signatures of Presidents of the United States, 1828-1927, 24 items. Other authors include James A. Garfield. Papers: In the John Hay Correspondence, 1854-1914, Fiske to Gilder, approximately 6,000 items. A letter from James A. Garfield to William L. Perkins written on March 24, 1877. In the letter, Garfield expresses thanks for Perkinss appreciation of his decision to decline the senatorship, which he sacrificed for the public good. The papers include a letter from J.A. Garfield to Ada Knowlton written in 1880, thanking her for sending a poem. A letter from James A. Garfield to J.A. Cowing written on June 20, 1868. In the letter, Garfield writes that he appreciates the kind words about his speech on finance in which I was developing the general principle which lies at the foundation of currency. Written on letterhead of Fortieth Congress with engraving of the Capitol. A printed and stamped check of the Sergeant-at-Arms, U.S. House of Representatives, paying to myself debt Seventy nine 51/100 Dollars. Signed by J.A. Garfield. A letter from James A. Garfield to J.H. Bartlett written on June 30, 1880. In the letter, Garfield acknowledges a letter. A letter from Samuel Colcord Bartlett to President-elect James A. Garfield written on January 24, 1881. In the letter, Bartlett recommends John A. Owen for a place on the bench. The papers of James A. Garfield include two letters of recommendation for office seekers; an invitation to Garfields inaugural ball; a facsimile of a letter from Garfield to Marshall Jewel, chairman of the Republican National Committee, denouncing as a forgery the Morey letter concerning Chinese immigration; an announcement of a memorial service in Garfields honor; a certificate issued to a contributing member to the Garfield National Masonic Memorial Association of Washington, D.C.; and typescripts of two speeches, ca. 1899 and 1906, delivered by an unknown alumnus of Hiram College and containing reminiscences of classmate James A. Garfield. A letter from James A. Garfield to Reverend W.M. Roe in Marion, Iowa, thanking Roe. Papers: 1851-1881; commemorative material 1881-present. 5 feet. Collection concentrates on his association with Hiram College as student, teacher, president, and trustee; includes papers and correspondence, photographs, portraits, and memorabilia. Finding aid in progress. Restricted. A letter from James Garfield to Mr. Wilson regarding payment of a note. Papers: 1856-1881, 0.15 linear foot. The papers include a photocopy of a military commission by General Garfield (1863) and published speeches by Garfield and others (1874-1886) on reconstruction, taxation and other contemporary issues. Papers: In the Howells-Fréchette Family Papers, 1844-1934, 176 pieces. Correspondents include James A. Garfield. Papers: In the William Henry Smith Papers, ca. 1836-1922, 65 items. Political correspondence includes letters from James A. Garfield to Rutherford B. Hayes (1880-1881). Papers: Dates unknown, approximately 3 linear feet. Correspondence, notes, inventories, guidebooks, articles, floor plans, plats, surveys, landscaping diagrams, photographs, and other materials relating to Lawnfield (officially known as the James A. Garfield Home), in Mentor, Ohio, now a national historic site under the jurisdiction of the U.S. National Park Service. A letter from James A. Garfield to his mother, Eliza Garfield, Hiram, written in 1881. In the letter, Garfields reassures her that witb time and patience his health would be restored, and he sends love to his sisters. Papers: Correspondence in the John Sherman papers, 1839-1921. 46 items. Papers: In the James Monroe Papers, 1819-1898,12.4 linear feet. The papers of James A. Garfield include a memorandum book, 1853-57; copies of bulletins and telegrams, 1881, concerning Garfields physical condition; diary, 1857-58, and other assorted items of Lucretia R. Garfield; and correspondence, including letters to Wallace J. Ford concerning Western Reserve Eclectic Institute, of which Ford was trustee and financial agent. Papers: ca. 1878-1942, 0.25 cubic foot. Scattered papers of James A., Harry A., and Abram Garfield. Includes catalogue of memorials to James A. Garfield, copies of correspondence with Harry A. Garfield as U.S. fuel administrator (1919), and a report by Abram Garfield on the Cleveland City Plan Commission (ca. 1942). Microfilm: In the Andre De Coppet Collection of American Historical Manuscripts, 1854-1936, 1 reel. 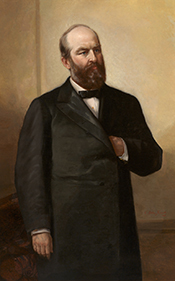 The papers contain selected letters, documents, and portraits of James A. Garfield. Papers: In the G. Volney Dorsey Papers 1834-1893, 18 items. The papers include a letter from James A. Garfield to G. Volney Dorsey written on December 23, 1880. Papers: In the Orramel H. Fitch Papers, 1828-1935, 0.25 cubic foot. Papers: In the John H. Klippart Papers, 1833-1933, 13 cubic feet. Papers: In the Anson G. McCook Papers, 1880, 2 items. A telegram from President-Elect James A. Garfield to Anson McCook from November 8, 1880, congratulating him on his congressional victory. Papers: In the Emerson Opdycke Papers, ca. 1861-1913, 2 cubic feet. Persons represented include James A. Garfield. The papers also are available on microfilm. Microfilm: In the William Henry Smith Papers, 1855-1895, 7 microfilm reels. A letter from James A. Garfield to J.H. Jones written on October 4, 1861. In the letter, Garfield invites Jones to join a party of Hiram College friends in a visit to the regiment in camp. A letter from James A. Garfield to J.T. Callin written on May 28, 1866. In the letter, Garfield writes concerning the prospects for his candidacy in the upcoming Congressional election. The collection includes letters from James A. Garfield to Charles Nordhoff, editor of the New York Evening Post, 11 May 1870, and General H.M. Cist, corresponding secretary of the Society of the Army of the Cumberland, 17 June 1873. Also included are portraits of Garfield and autographs of his cabinet members. Additionally, there are two letters by Charles J. Guiteau, Garfields assassin, and autographs of Guiteau, his attorney, warden, judge, and jury. A second medical bulletin on James Garfields condition issued to the public after his move to New Jersey. Written in the hand of Dr. D.W. Bliss and signed by him and five other physicians including D. Hayes Agnew, Frank H. Hamilton, Robert Reyburn, and Joseph Janvier Woodward. With an ANS by Bliss, 10 December 1884, certifying this was the original bulletin with original signatures. Papers: In the United States Sanitary Commission Subscription Book for Facsimiles of the Emancipation Proclamation, ca. 1863, 1 item. Signers include James A. Garfield. A letter from James A. Garfield to Horace Steele written on September 25, 1878. In the letter, Garfield reflects on recent political developments in Colorado and the silver question as reported by a Mr. Higley of Youngstown. A letter from James A. Garfield to J.A.J. Creswell written on December 12, 1865. In the letter, Garfield introduces himself to J.A.J. Creswell about a Mr. Doekelader, a friend of General Schenck and James A. Garfield. Papers: In the J. Ross Browne Letters, 1849-1859, 1 portfolio. Papers: 1861 and 1881, 1 folder. One Civil War letter by James A. Garfield, major general in the Union Army and future President, to Colonel Lionel A. Sheldon, criticizing the Presidents [Abraham Lincolns] conduct of the war and noting that Halleck is as cold and apparently heartless as a stone about the war, McClellan will never do any more than Buell did - and nearly every man that had any positive opinions about pushing the war is either without any command or is where he can do nothing. Washington, 2 Nov. 1862. Also an extra edition of The Chronicle, 21 Sept. 1881, concerning the death of Garfield and an invitation to the Obsequies of the Late President Garfield, to be held in San Francisco, 26 Sept. 1881. Papers: 1871-1881, approximately 350 items. The collection contains three letters by James A. Garfield, newspaper clippings, campaign ribbons and buttons, family photographs, a scrapbook, and other memorabilia. Material relates primarily to Garfields 1880 political campaign, inauguration, and death. Includes clippings and facsimile bulletins concerning the assassination of the President by Charles Guiteau, souvenirs of memorial services, and correspondence to the Rev. James S. Hoyt of Massachusetts about his memorial sermon for Garfield. Three letters from James A. Garfield, Mentor, Ohio, to John P. Haire, Janesville, Wisconsin. The letters are dated May 14, 1877; June 22, 1880; and Nov. 6, 1880. Papers: In the Louis Evans Ayres Papers, 1861-1973, 0.25 linear foot. The papers include a letter from James A. Garfield written in August 1861 describing Civil War activities. Papers: In the Henry S. Frieze Papers, 1838-1920, approximately 600 items and 18 volumes. Papers: In the Hinsdale Family Papers, 1857-1963, 2 linear feet. Papers: In the Irving Asher Papers, 1880-1975, 1.25 cubic feet. Autographs, a portrait, and a regular Republican ticket with names of presidential electors relating to James A. Garfield. Papers: 1857-1936, 4.1 linear feet. The papers of James A. Garfield contain correspondence, a diary (1873), and newspaper clippings, relating to Garfields career and assassination, Garfield Monument in Lakeview Cemetery, Cleveland, and the establishment of Lawnfield, his home in Mentor, Ohio, as a memorial museum. Includes correspondence (1874-1900) of his wife, Lucretia Rudolph Garfield. Correspondents include N.L. Chaffee, Burke A. Hinsdale, Frederick Kinsman, and Charles Whittlesey. Papers: In the James A. Garfield Family Papers, Series II, 1871-1937, 0.2 linear foot. Papers: In the James A. Garfield Family Papers, Series III, 1859-1990, 3.1 linear feet. Papers: In the Jesse Baldwin Papers, 1862-1881, 4 volumes. Papers: In the Warner M. Bateman Papers, 1849-1897, 8.8 linear feet. Correspondents include James A. Garfield. The collection also is available on microfilm. Papers: In the Henry B. Boynton Papers, 1854-1887, 0.2 linear foot. The papers include letters to Henry Boynton from his cousin, President James A. Garfield, clippings relating to Garfields death, and journal (1854-56) kept by Boynton and his brother, William A. Boynton, student at Hiram Eclectic Institute and bookseller. Papers: In the John Butler Papers, 1862-1885, 0.4 linear foot. Papers: In the John Healy Papers, 1857-1932, 0.25 linear foot. Papers: In the B. A. (Burke Aaron) Hinsdale Papers, 1854-1901, 2.3 linear feet. The papers document B.A. Hinsdales association with James A. Garfield, and his writing of The Works of James Abram Garfield (1882-83), containing information on Garfields early life and the Republican convention of 1880. Papers: In the Peter Hitchcock Family Papers, 1788-1898, 19.8 linear feet. Papers: In the William L. McMillen Papers, 1852-1896, 72 items. Papers: In the A. G. Riddle Papers, 1835-1902, 2.6 linear feet. Papers: In the David Gaskill Swaim Papers, 1861-1874, 4 linear feet. Papers: In the Walter B. Wright Scrapbooks, ca. 1840-1936, 0.83 linear foot. Papers: ca. 1853-1951, 3.5 linear feet. The collection documents primarily the campaign, assassination and death of President James A. Garfield, 1880-1881, through clippings, cartoons, sheet music, programs and other ephemera. Also included is Garfields correspondence from, or relating to, Williams College. Papers: In the Paul A. Chadbourne Papers, 1849-1886, 2 linear feet.